If there is a need to have access to FF process variables in the AC 800M controller, connectivity between the HSE subnet and the controller is established with the CI860 - the Communication Interface FOUNDATION Fieldbus HSE. Then FOUNDATION Fieldbus process data on HSE can be accessed from the IEC 61131 applications in the AC 800M controllers. For this purpose, the CI860 module maps the value and status parts of the FF signals to the IEC 61131 application and vice versa. 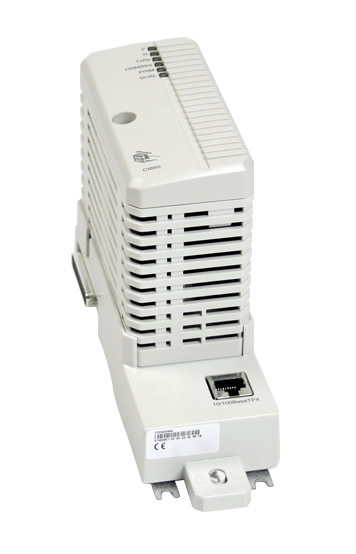 The CI860 is powered by the processor unit, via the CEX-Bus, and therefore does not require any additional external power source. Up to twelve CI860 modules can be placed at one AC800 M also in redundant mode, and each of them can be connected to the same or to a separate FOUNDATION Fieldbus HSE subnet. The ABB FOUNDATION Fieldbus Linking Device LD800HSE/LD 800HSE EX acts as a gateway between the HSE subnet and up to four separate H1 links.